Bradley’s bariatric grab bars bring more options to accommodate needs of people of all sizes in all types of commercial restroom applications. 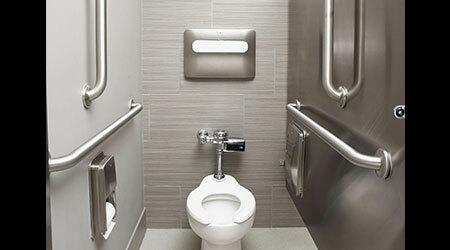 Bradley’s grab bar models are rated at 900, 1,000 and 1,250 pounds to provide ultimate user stability. A wide selection of grab bar configurations are available to furnish a variety of restroom layouts and address a variety of user needs. Bradley’s bariatric shower seats are also available with ratings from 500 pounds to 1,200 pounds, providing stability and comfort in shower rooms. Made of resilient phenolic and Bradmar solid plastic materials, these folding shower seats allow users to easily fold up the seats when not in use.